Last week, I showed how I quilted the background of the star blocks. This week, I will show how I quilted the center butterfly square. Maybe a star over the block? No! Maybe some continuous curve over the block? No! Maybe some cross-hatching over the block? No! Maybe some swirls over the block? No! Maybe swirls behind the butterfly? Yes! The Preview Paper saved me from a lot of un-stitching. That stuff is worth it's weight in gold! Next week, I will show how to quilt the white border triangles. Be sure to come back and check it out! Welcome to week 6 of the Stop, Drop and Roll Quilt Along! I am hosting this for the Old Red Barn Co. Flickr group. This week, all of the free-motion quilting patterns are based on a loop. For the top thread, I used Tutti from WonderFil, color TU19 Lavender. For the bobbin thread, I used DecoBob. by WonderFil, color DB314 Lilac. Today's free-motion quilting pattern is pebbles! To keep my loops round, I stitch over one and under the next. To get from one place to another, I retrace the pebbles. 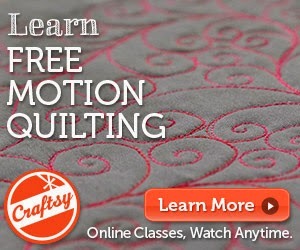 Stop back next week for more free-motion quilting designs! Today's free-motion quilting pattern is a loopy border pattern that would also make a great block pattern. Stop back tomorrow for another loop design! I'm on my way to the Vermont Quilt Festival. I'll be teaching seven classes on longarm and machine quilting, so my car is very, very full!!! Today we are doubling tripling our free-motion quilting fun with triple wandering loops! Could you hear my cat in the background? His name is Spike. I was quilting outside (it was too hot in my house!) and he was complaining about being left inside from the screen door. I start the second and third loops where the first one crosses. In person, these threads are luscious and purple, but they look nearly white in the photos. Today's free-motion quilting pattern is a simple wandering loop. Since I know that you have the latest copy of Fabric Trends and that you are making the Papillon quilt (scroll down) designed by my good friends at the The Quilt Basket, I will show you how I quilted the sample. Last week, I showed how I quilted the outline of the star blocks. This week, I will show how I quilted the background of the star blocks. Next week, I will show how to quilt the center butterfly block. Be sure to come back and check it out! Welcome to week 5 of the Stop, Drop and Roll Quilt Along! I am hosting this for the Old Red Barn Co. Flickr group. This week, all of the free-motion quilting patterns are based on a single curve, like the letter "C". For the top thread, I used Tutti from WonderFil, color TU10 Roses. For the bobbin thread, I used DecoBob. by WonderFil, color DB209 Raspberry. Like yesterday, today's free-motion quilting pattern could be considered a holiday pattern. I quilt holly in borders, blocks, and as an all-over design on many Christmas quilts. I usually pause in the corners to allow the machine to take an extra stitch. This makes my corners nice and sharp. When I need to stop the machine, I stop in a corner. If I stop in the middle of a design, the stop/start will leave a visible jog. Next week's designs will all be based on loops! Today's pattern can be considered a Halloween pattern, but I quilt spider webs on other types of quilts, too! Visit again tomorrow for another single-curve free-motion quilting design. I love today's pattern! It looks like a fern and I use it as an overall design, a block design, a border design, or anywhere else I want to see a fern. When stitching the fern, keep the bottoms spaced a good distance apart on the stem. If the fern is very narrow, it will "fall over." Today's pattern is a simple flower. I have used this as an overall design and also as a block design. It is simple and it looks great. I love that combination! If you have the latest copy of Fabric Trends, you, of course, want to make the Papillon quilt (scroll down) designed by my good friends at the The Quilt Basket! Last week, I showed how I quilted the stitch-in-the-ditch. This week, we are quilting in the outline of the star blocks. Next week, I will show how to quilt the background. Be sure to come back and check it out! Welcome to step 4.5 of the Stop, Drop and Roll Quilt Along! I am hosting this for the Old Red Barn Co. Flickr group. Finally, we quilt! All of the quilt patterns this week are practicing this week are based on straight lines. For the top thread, I used Tutti from WonderFil, color TU01 Sunny. For the bobbin thread, I used DecoBob. by WonderFil, color DB131 Dark Gold. Today's pattern is similar to the first pattern we quilted this week. Instead of quilting horizontal and diagonal lines, I quilted lines in all directions. When I chalk a grid, I use a template and Quilter's Pounce powder. It goes on fast, and the powder irons off when the quilting is done. When I retrace a line, I do not worry if I do not retrace it perfectly. I think a little daylight showing between lines adds some character to the design. Welcome to step 4.4 of the Stop, Drop and Roll Quilt Along! I am hosting this for the Old Red Barn Co. Flickr group. Today's pattern is a little different. I chalked a grid over the quilting area so it would be easier to keep my free-motion quilting evenly spaced. I consider a chalked grid a "quilter's little helper" and often use this little trick. Check back tomorrow for another straight-line design. Welcome to step 4.3 of the Stop, Drop and Roll Quilt Along! I am hosting this for the Old Red Barn Co. Flickr group. All of the quilt patterns this week are practicing this week are based on straight lines. I learned how to quilt on my home machine after I was a longarm quilting teacher. Weird, right? When I first tried to quilt, I felt like I was fighting the fabric. I could not get my stitches even. None of the designs I was so good at on my longarm machine would show up on the fabric! I started to train myself to work with the fabric. I started with straight lines. I told myself that maybe I could not make beautiful feathers, but that I could probably make a series of line segments. Today's pattern uses horizontal, vertical, and diagonal lines. It makes a great overall design and I actually used just one line of this design as a border on a quilt for a customer on Monday. Have you seen the latest copy of Fabric Trends.? You should go buy it right away! And then you should go make the Papillon quilt (scroll down). My good friends at the The Quilt Basket designed another fantastic quilt! I am going to help you out with making this quilt. I quilted the sample in the magazine and filmed while I was quilting it. Each week during the summer, I will post another video clip showing how I quilted this quilt. Sound good? 2. Buy the latest issue of Fabric Trends! Welcome to step 4.2 of the Stop, Drop and Roll Quilt Along! I am hosting this for the Old Red Barn Co. Flickr group. All of the quilt patterns this week are practicing this week are based on straight lines. Free-motion straight lines. If that scares you, think of them as straight-ish lines, or lines that are "mostly" straight (for the Princess Bride fans). I used my Janome 6600 for this video. I bought it at my favorite quilt store, The Quilt Basket. I have owned this machine for about 2-1/2 years, and the honeymoon is not over. This is a fantastic machine for piecing and also does a superb job of quilting as you will soon see. I used the darning foot on the machine and I dropped my feed dogs. Even though the first machine quilting teacher told me to "quilt fast and don't stop," I quilt rather slowly. I set my machine to the speed I want to quilt, and then put my pedal to the floor. This helps keep my stitches a consistent length. Welcome to step 4 of the Stop, Drop and Roll Quilt Along! I am hosting this for the Old Red Barn Co. Flickr group. This week, we are going to quilt! Are you excited? I certainly am!!! I live in the woods and lighting in my house is always a problem. I decided to move my sewing table outside to gain as much natural daylight as possible. Along with natural daylight, however, come noises such as birds, airplanes, and lawnmowers. I felt the the benefits outweighed the drawbacks, so enjoy the quilting videos -- and the sounds of my yard. I used my Janome 6600 for this video. I bought it at my favorite quilt store, The Quilt Basket. I have owned this machine for about 2-1/2 years, and the honeymoon is not over. This is a fantastic machine for piecing, and does a superb job of quilting as you will soon see. I used the darning foot on the machine, and I dropped my feed dogs. Yes, I use different thread on the top and in the bobbin. No, the quilt police have not arrested me yet. To check my tension, I quilted some circles and some points. If my stitches looked bad, I would have adjusted the machine until I was happy with the look of my stitches. I am going to post each video in a separate blog post, so keep checking back. I hope to get back to my regular posting schedule one day, but I fear it will not be soon. Welcome to step 3 of the Stop, Drop and Roll Quilt Along! I am hosting this for the Old Red Barn Co. Flickr group. First, I find no reason to bend and crawl on the floor to baste a quilt. I borrowed a kitchen table (my table is too small!) and laid out my backing. I pieced the backing from a bunch of bright squares leftover from other projects. Using the ever-popular blue painter's tape, I taped the edge and sides of the backing to the kitchen table. I let the leftover fabric hang off the edge. I laid my batting over the backing and smoothed it in place. Then I rolled it to the edge of the table and grabbed my basting spray. After I lightly sprayed the backing fabric, I rolled the batting back on, smoothing as I went to make sure the batting had no bumps in it. Next I centered the quilt top over the batting. I rolled it back to the center and once again grabbed my basting spray. I lightly sprayed the part of the batting that would be covered with the quilt top. If I had sprayed all of the batting, the extra batting would stay sticky, and that is not good! Next, I rolled the quilt top in place, smoothing as I went. I then removed the tape and reversed the quilt. I taped the other half of the backing to the table. Then I rolled the quilt top back to the center and next rolled the batting to the center. It was then time to grab the basting spray again. I lightly sprayed the backing of the quilt and rolled the batting to cover, making sure the batting was smooth and had no bumps in it. Next I prepared to baste the last half of the quilt top in place. I sprayed the part of the batting that would be covered with the quilt top and then rolled the quilt top in place. I removed the tape and inspected my basting job from the front. There were no bumps or pleats of fabric. Had there been any, I would have been able to gently peel the fabric back and re-stick it in place. Next I turned the quilt over to inspect it for pleats or bumps. There were a few tiny ones, and I simply rubbed my hand over them and smoothed out the backing. Now that the basting is complete, I can roll the quilt up and prepare for quilting! It actually took longer to write this blog post than it did to baste the quilt top. Next week we get to start quilting!!!! Yay!!! I forgot to photograph Valerie's bag and Jacqueline's bag. And many other bags, too! Oops!